It does not matter if you work for a local estate agent or a national firm - the amount of business the right display can bring through your door completely justifies the initial investment. The reality is that estate agent displays remain popular to this day because they are the best way to fill the shop window space. At Pure Display, we have several estate agent window displays available to buy all for cost-effective, competitive prices. At Pure Display, we have three different types of estate agent displays from which you can choose. All of them offer various benefits and are available in a number of sizes and shapes to suit your storefront. This ‘system’ is currently the most commonly used. 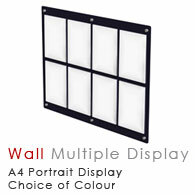 Many estate agents opt for A3 or A4 so that their display and really catches the eye of those walking past. However, they are also available in A5, A2 and A1. LED light pockets can really make all the difference to your window display, especially when it is dark. 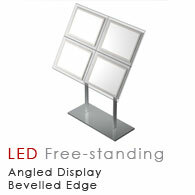 The LED light pockets illuminate the display so that it is easy to read, and so it stands out. While the illuminated LED light panel display systems are more expensive one could justifiably argue that the benefits outweigh the jump in cost. This type of display has a number of benefits for estate agents. It’s simple to assemble, does not require installation and, maybe most importantly, easy to maintain. 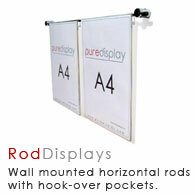 A single support pole (or double depending on your preference) keeps your display tidy at all times, and when it comes time to change the display, it barely takes any time. Browse these categories under "Estate Agency Displays"
Featured products under "Estate Agency Displays"
Some more categories under "Estate Agency Displays"
Above are the three estate agent displays on offer from Pure Display. 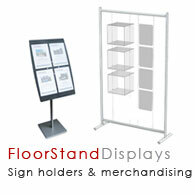 If you have any questions about our displays or any of the other products that we offer, please contact us today. The posters are easy access to allow frequent changes to property listings. 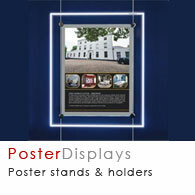 Further information about displays for new and existing estate agents. More general ideas for window displays.